According to Boats Group (Boats Group), the division of Dominion Enterprises that operates YachtWorld, boats.com, Cosas de Barcos and the U.S.-based Boat Trader, the Cosas de Barcos portal has been thriving since it became part of the group in February. Cosas de Barcos was already a clear market leader in Spain when it was acquired by Boats Group in February 2014, and it has clearly been given a significant boost by joining the world’s largest marine website group. Cosas de Barcos now features almost 80,000 boats for sale in Spain, around twice the number it had less than a year ago, and its number of registered dealership customers has grown by around 24%. Cosas de Barcos has especially strengthened Boats Group’s presence in France and Italy, where similarly strong progress has been made since the acquisition. As an example, by harnessing the power of Boats Group’s combined brands, the group has increased its number of large dealership customers in France by 85%. 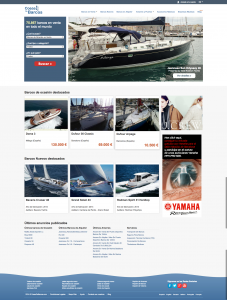 The collaboration between the Cosas de Barcos and Yachtworld brands is also evident in that approximately 300 customers have already decided to display their boats across all of Boats Group’s portals. Cosas de Barcos is now well established as a key part of Boats Group’s global presence. It has added five more members to the team at its Barcelona headquarters, with plans to move into larger offices in the coming months. With more than 180 employees and 23 localised web portals which are translated into 13 languages, Boats Group has always sought to provide the best online customer experience by offering the best advertising and software solutions. Boats Group has become the definitive information resource for boat buyers, sellers, dealers and boat manufacturers alike, with more than 52 million unique visitors in 2013 researching products on Boats Group web and mobile sites, apps and social media outlets.